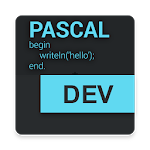 The application is a Pascal interpreter on Android. 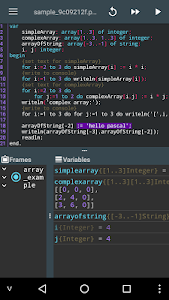 This application is confusing for everyone to learn Pascal on the mobile without a computer, so that we can practice anytime, anywhere. - Compile Pascal programs and run them without Internet. ★ Menu edit: Undo, redo, copy, paste. 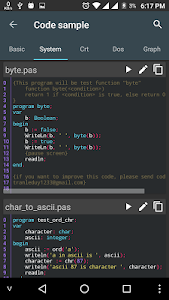 ★ Auto format: automatically reformat the code for easier viewing. ★ Find / Find and replace: Regular Expression support. ★ Goto line: Move the cursor to a line. 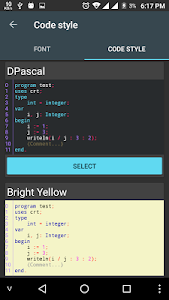 ★ Highlight code: highlight the keywords. 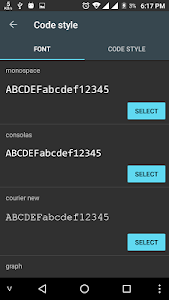 ★ Code style: many interface for the editor. ★ Font size, font, word wrap. - The "aRecognition" library converts speech to text (requires Google Voice). 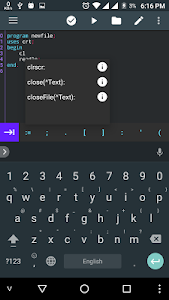 See example speech_to_text.pas. I am constantly working to improve this product. If you want to help me with the content (language translation, example code), please contact me via mail. I am very happy for your support. 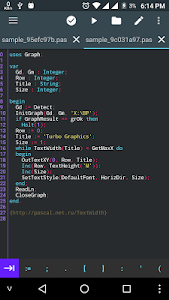 Similar to "Pascal N-IDE - Editor And Compiler - Programming"